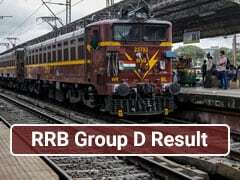 RRB Group D Result: RRB Group D result has been released. RRBs are uploading the result pdfs one by one and the process shall be completed soon. Meanwhile, here’s the latest update on what’s next. The candidates whose roll number has been listed in the result pdf have been selected provisionally for Physical Efficiency Test (PET). As opposed to what RRBs had advertised earlier that candidates equal to twice the number of vacancies will be called for PET, RRBs have shortlisted candidates equal to three times the number of available vacancies. The list does not have the roll numbers of Persons with Benchmark disabilities(PwBD) who have qualified, since these candidates are exempted from PET. Candidates will be able to view their normalised Marks and shortlisting status for PET by logging in through the link provided on the official websites of RRBs. They would need to enter their Registration Number and Date of Birth in DDMMYYYY format, RRB Group D result will be available for viewing till 15th March 2019. Now that the RRB Group D Result has been released, the rest of the selection process will not be conducted by RRBs and instead will be conducted by Railway Recruitment Cells (RRCs).